Happy winter times, crazy party peeps! I hope your week has been chock full of open fireplaces, cocoa and curling up and reading a book. Unless you are in the northern hemisphere where that would be weird… But this is a no judgment zone so you do you! After battling actual real snow whilst doing my outdoor weight training on Wednesday morning (third time in my life I’ve seen snow – yay!) there has been actual time at the sewing machine and time to work through a backlog of projects. Huzzah! So welcome to number two in the blog catch up – a totally seasonally inappropriate dress! Brrr! 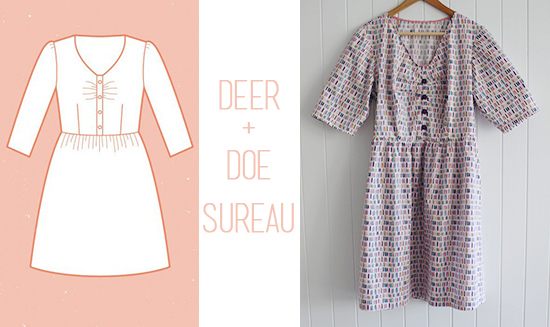 This familiar looking frock is the Sureau Dress by Deer and Doe. I’ve made two versions previously and decided to mix it up this time by including sleeves. Yup – I’m on the edge! The fabric is cotton poplin from Spotlight. It presses like a dream and is a print from their Cloud 9 designed range. I have a serious weak spot for the Cloud 9 fabrics to the point when there are new releases my rad sewing friends picture text me to let me know. ¯\_(ツ)_/¯ Does it classify as a problem if you just decide to embrace it?! The construction of my old friend was smooth except where I started to freestyle with the pattern. But isn’t that what we love about sewing?! For some odd reason I got paranoid about skirt and sleeve length and added 5cm to both whilst cutting the pieces. This ended up being an epic fail as the skirt was shortened by 10cm and the sleeves by 15cm – oops! I also didn’t have to worry about an FBA as Deer and Doe draft for a larger cup size. Lazy lady epic win! The big freestyle victory on this dress is what I have dubbed “super ninja secret zip pockets of doom”. As the Sureau is sadly pocketless what was a lass to do but add some sweet pockets, keep the zip on the side and spend an afternoon drinking all the wine and suffering through three different attempts at test pocket/zip insertion. Sure, I could have googled it but where is the fun there? Sadly, I forgot to take notes and have no idea how exactly I made it work but I figure there are a bunch of online tutorials and now I have the smug satisfaction of having rad zip pockets that you can smuggle a gnome in. Win! The gently gathered bust. This provides some literal and figurative room to move so FBAs are not essential. Also, it’s a cute design feature! The V-neck. I love things that aren’t up around my ears. Super ninja secret zip pockets of doom. How cool is it when you learn a rad new skill. Then forget it. Because you drank all the wine and forgot to write it down. I want to say try the facings here but we all know that is a lie. Team Bias Binding for the win! Bring the waist in. I went the size up for this version and whist that is great for my bust and hips my waist is lost unless there is some belt styling happening. Waist grading for the win! Go sleeveless. The sleeves are cute but there just not my bag. Overall, I’m happy with this Sureau. The sleeves and poplin combo make it a great transitional piece but sadly Canberra has gone Hoth for the winter. Ugh! I think we all need to do what Pimble does – put on your sassiest turtleneck and soak up the sun where you can! Your dress looks lovely on, the fabric is lovely and it’s good to know it caters for a bigger bust, I brought this pattern ages ago and yet to make it but it’s just moved up my sewing list. I’m never sure on sleeves on dresses either, feels a bit overwhelming in print sometimes. Pimple is so cute!! Thanks, Lynsey! I like Deer and Doe for their larger bust size – it makes things a little easier which is always a win. And yeah, pattern sleeves can be bananas sometimes. I was with my bestie when I bought the fabric and she was doing the “hells no” face at the idea but came around once it was above the elbow length. I think any longer and it is overwhelming. Lovely sureau-dress Amanda. Makes me want to sew another too. Thanks, Susanne! You totally need more – give back in to the Sureau! I have also mastered the art of the seasonally inappropriate finish, my greatest achievement was finishing a wool ‘grandpa’ sweater in May (northern hemisphere). At least with tights and boots this dress totally works! I need to make another sureau, I love this pattern! Love your fabric choice and the sleeves are good for winter right? If you want to see more snow, you just need to visit the uk! You totes need another Sureau, Sabs! Brrr! Snow is pretty but my fingers ached all day after that PT session. I’m not sure how you guys handle it! Aaaah, seasonally inappropriate sewing, my specialty!! I love your dress, and your novelty prints, always so fun and cheerful. Make more!!! And pockets!! of course everything is better with pockets. It’s surely got to be summer soon, right?! Have to say I was pretty chuffed with my magic pockets – all pockets all the time now! Facings! FACINGS! I love them so….. This is very cute, even sans facings. Super cute dress!! And your Pimble is adorable! Team no-facings here too! No flappy bits! Bias binding allllllllll the way. And who cares if it initially seems seasonally inappropriate? I’m loving it with boots and tights and throw on a sassy sweater/jacket/cardigan/warm thing and you’re good to go. Thumbs up. Yes! All the cool kids are anti-facings 😉 Surely it will warm up soon so I can wear this sans-tights?! This has been a horrid winter CBR way – may need to do a Sydney trip STAT! OMG Pimble in the turtleneck! I’m dying! Too cute! You’re rocking this look! Cute! Isn’t she such a snuggle bear?! I need to get her a new jumper as this one is stretching out. Tiny puppy jumpers are the cutest! love the combo of fabric and pattern, and the square buttons, oh and the gnome pocket…. Thanks, Colette! My husband just shook his head when I showed him the gnome pocket photo. Poor guy!